Even the best shots could use some help from time to time. Whether you are a hunter, sports shooter, or someone who enjoys target practice; the desire to be the best shot among your friends exists. Having bragging rights at gatherings gives you the upper hand during any debate over the best shooting equipment and gives your opinion a seal of validity. Owning a quality shooting stick is necessary for any field shooter who wants to make every squeeze of the trigger count. Shooting sticks are easily portable weapon mounts than can be monopod, bipod, or tripod. It’s important for any serious shooter to know what company makes the best shooting stick as nothing is worse than having your equipment break while you are in the field. This may be the most important section. While price is always important, it’s worth paying a little bit more to have long lasting equipment you can depend on. Therefore, we compared the trigger sticks to see determine which provides the best deal. Primos Gen 2 Bipod Trigger Stick. This trigger stick from Primos is one of the best bipod sticks available, however high price tag makes some hesitate despite the quality of the product. While it contains the ability to easily adjust the height, there are several issues with the product that make it slightly overpriced. Primos Gen 2 Tall Monopod Trigger Stick. Primos seems to have a slight issue with overpricing their equipment. While this monopod is a quality product it comes at a high price for a monopod, making it far from the best deal available. 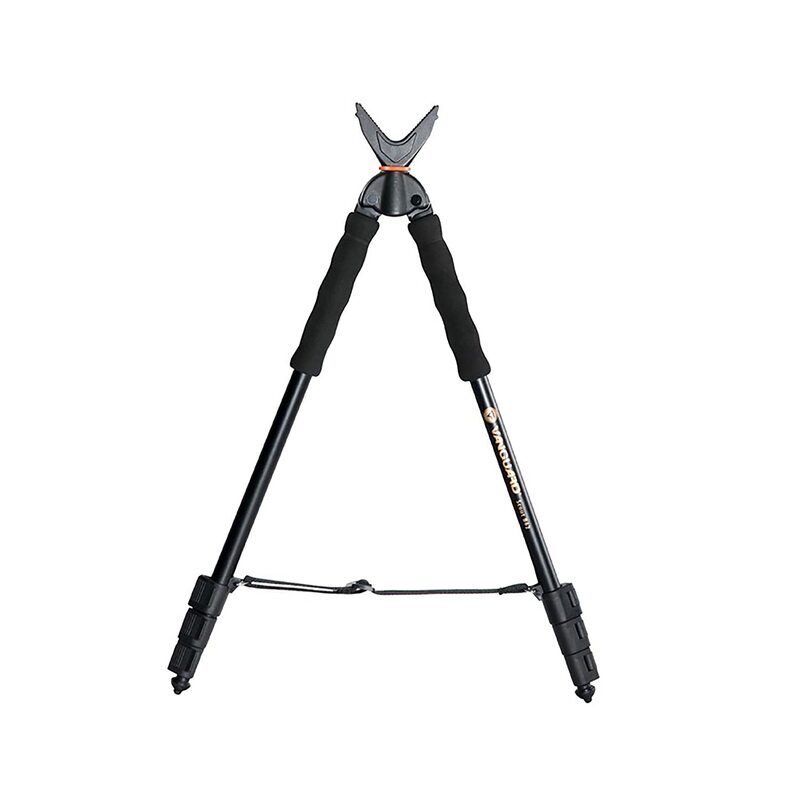 Hammers Telescopic Shooting Tripod. This tripod sells for an extremely modest price. 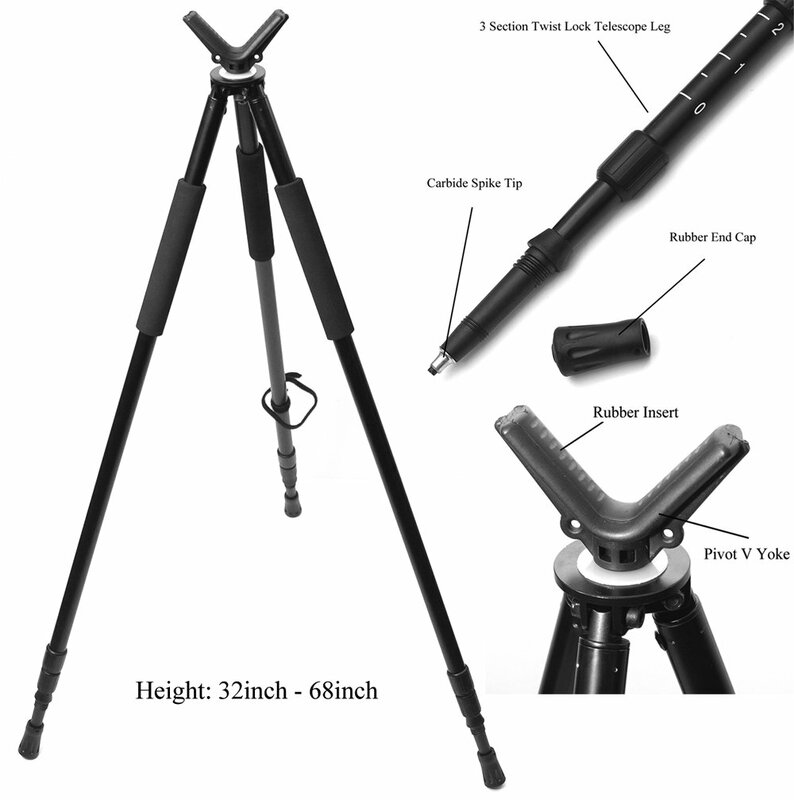 The sturdy shooting platform provided along with the wide range of adjustable heights makes this tripod one of the best around. Vanguard Scout B62 Bi Pod with V-Shaped Yoke. This Vanguard option is a great value. It’s extremely difficult to top the price, durability, and the quality of this bipod. Vanguard Quest T62U Shooting Stick. Vanguard does it again, for a reasonable price you could have this 3-n-1 monopod, bipod, tripod model. It’s slightly heavier than other models, but that should not make anyone balk at the price. Bog-Pod SB-2 Sportsman’s Bipod Shooting Stick Swivel Head. This bipod comes at what we see as a fair p There are some issues with it, but the cheap price helps cover up those issues slightly. How well does each shooting stick hold up in the field? We are judging each stick on the materials used to build it and how they hold up during adjustments and consistent use in real life scenarios. Primos Gen 2 Bipod Trigger Stick. Despite being made out of high quality aluminum, this bipod trigger stick has reported to have several problems breaking and from stiffness in the legs. While it’s a quality stick, there are questions around how durable it actually is. Primos Gen 2 Tall Monopod Trigger Stick. 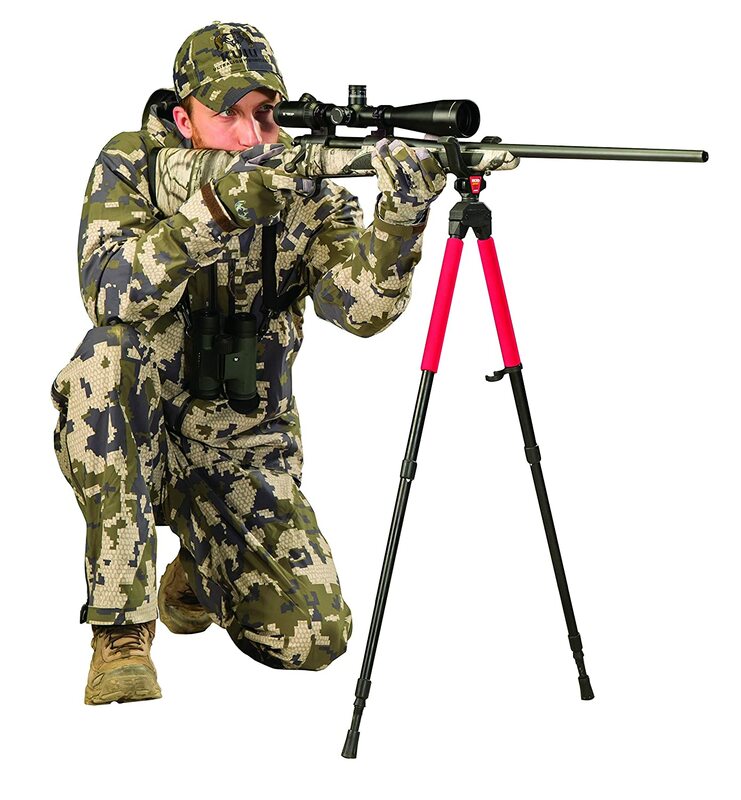 This Primos monopod is made out of the same aluminum as their bipod product. While less reported issues than the bipod model, it seems the monopod has fewer issues because it doesn’t have to deal with two legs. Hammers Telescopic Shooting Tripod. Extremely durable, Hammers delivered a great and durable product. There’s not much else that needs to be said, this stick holds up extremely well. Vanguard Scout B62 Bi Pod with V-Shaped Yoke. The Vanguard Scout definitely isn’t the most durable trigger stick. There have been multiple issues reported with the legs being too thin, which have led to breaking and accuracy issues for shooters. While not terrible in this section, it’s far from the most durable offering. Vanguard Quest T62U Shooting Stick. Far fewer reports have been made over the durability of this Vanguard model. Overall it holds up extremely well with the only major complaint being the ease that the yolk comes off. This is by far most durable option Vanguard offers. Bog-Pod SB-2 Sportsman’s Bipod Shooting Stick Swivel Head. There are several components of the Bog-Pod which cause durability issues. Owners have to be careful making adjustments, extending the legs, and many have to do quick repairs to make the model usable. How easy is it to use each trigger stick in the field? This is an important factor as time wasted setting up your stick during a hunting trip could cost you a quality shot at a deer, squirrel, or other game. Unfortunately, not every stick is easy to place into position. From our selection which is the best shooting stick for hunting? Primos Gen 2 Bipod Trigger Stick. This offering from Primos grades extremely well in functionality, hunters especially love how easy it is to maneuver and use in the field. The Gen 2 bipod also does well due to being extremely light. Primos Gen 2 Tall Monopod Trigger Stick. Primos is a quality brand for functionality, their monopod trigger stick also delivers in this area. It’s difficult to find any complaints concerning either of their models appearing on this list. Hammers Telescopic Shooting Tripod. Tripods in general are not as functional as other trigger sticks as they take longer to set up and require attention to make sure you do not over extend the legs. However, Hammers does a good job with their Telescopic model making it as functional as possible. Vanguard Scout B62 Bi Pod with V-Shaped Yoke. While being a solid in this section, there are several noise concerns when trying to quickly attempting to set up the Vanguard Scout. The thin legs of this model also reduce the overall functionality. Vanguard Quest T62U Shooting Stick. This 3-n-1 shooting stick can literally do anything, it’s slightly increased weight does not reduce the functionality at all. This is an exceptional model for all that it offers. Bog-Pod SB-2 Sportsman’s Bipod Shooting Stick Swivel Head. Slightly hampered by its increased weight and lower maximum height than other models. The Bog-Pod just doesn’t measure up to the other trigger sticks on the list in this category. Different from functionality in that this section is comparing the different height, situations, and products that can be used in conjunction with the shooting stick. This is an extremely important category as target sticks need to be versatile. Primos Gen 2 Bipod Trigger Stick. This model can be used in a number of tough environments and receives praise for its versatility. The shooting stick also can be fitted for cameras, bows, and crossbows. This is the category where Primos Gen 2 bipod stands out the most. Primos Gen 2 Tall Monopod Trigger Stick. This model is hampered by the fact that it is a monopod, yet it does still function in a number of tough weather conditions. However, when considering the other models it’s being compared with—a monopod just doesn’t measure up in this section. 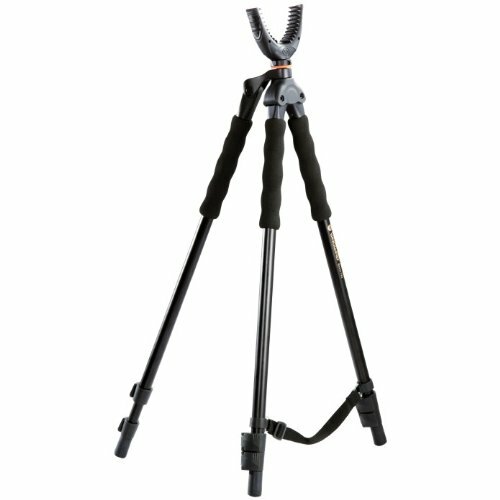 Hammers Telescopic Shooting Tripod. The Hammers Telescopic can be used for both cameras and guns. This model is also flexible in how many different positions it can be used from due to height adjustments. Hammers delivered quite well with this model. Vanguard Scout B62 Bi Pod with V-Shaped Yoke. A solid offering from Vanguard, despite not containing a traditional camera mount. Other than that, it can be used in a variety of different climates, heights, and in multiple terrains. Vanguard Quest T62U Shooting Stick. Literally the Vanguard Quest is the industry standard in this category, it can literally do anything, anywhere, for anyone. Bog-Pod SB-2 Sportsman’s Bipod Shooting Stick Swivel Head. The 40’’ height maximum hurts the Bog-Pod here as well. While it is capable in multiple terrains, it may not be suitable for some crossbows as well. This model again doesn’t match up with the others. From reading our reviews in the categories above it’s apparent the Bog-Pod SB-2 Sportsman’s Bipod just doesn’t measure up to the rest of the field, which is why it has a modest price. While not winning either category both the Primos Gen 2 Tall Monopod and Primos Gen 2 Bipod Trigger Stick measure up well to the competition, however both are slightly overpriced. The Vanguard Quest T62U and Vanguard Scout B62 are both extremely solid options, but the versatility of the Quest makes it a naturally better option when deciding which trigger stick is the best offer. Let’s not forget the Hammers Telescopic Shooting Tripod which also performs quite well in several categories, it’s only hampered by the natural limitations of a tripod. You won’t find a better deal than the low price for the 3-n-1 Vanguard Quest. Why is it the best shooting stick? There isn’t any situation where it doesn’t excel and the affordability of the stick makes it an incredible purchase no matter what you plan on using the stick for. Shooters and photographers would both be pleased by the versatility of the stick. If you are in the market for a shooting stick, we recommend this model as there isn’t anything currently available that can compete with it.